Well done to all the squad on a day of great performances! Having revisited the results of the NJL I find it quite reassuring regarding the state and the future of our club. Although it is now two seasons since we were in Division 1 of NJL. The recent results show we are developing a new strong squad of players that may soon take us back there. 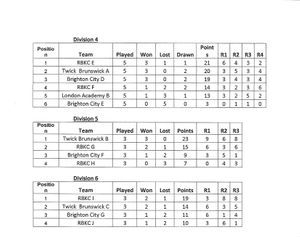 Our A and B teams in Divisions 4,5 respectively between them played 8 matches and were undefeated 2 draws however cost the A team promotion. The C team won their matches against the top and 3rd place teams, but lost to the team that finished bottom of the 6th division. It was a a great day out at the 2017 London Youth Games yesterday and well done! to Jules, Arya, Oliver, Davide and Linda who represented the borough and club and Twickenham Brunswick along with three Richmond Park Academy girls. The results: We lost every match... Some great efforts and performances but better still they turned out while thousands in the Borough either did not relish the challenge, have the ability or know that the opportunity was there. 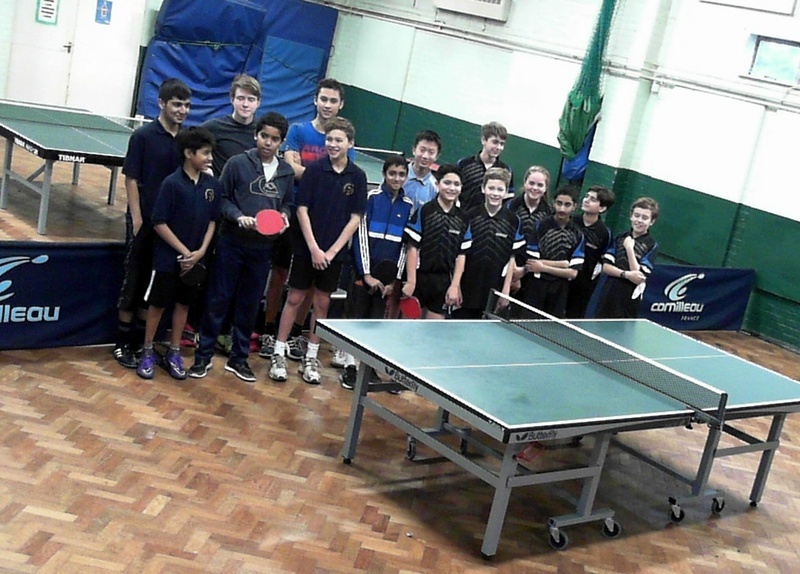 2016 has been a good year for Richmond Upon Thames in table tennis. Last year we had no girls team but this year five girls went to Redbridge to compete on behalf of the Borough. A defeat by the narrowest of margins in the first round losing 3-2 but going to deuce in the fifth set of the doubles was a magnificent effort. The girls then won the next round but again lost out in the doubles of the final round. But the young team have many more years ahead of them if they keep playing . Jaikalin, Eli and Julia slightly more experienced players were ably supported by a more mature Yasemin and a very supportive Jess. The Boys team exceeded all expectation really. Finlay Feil and Joseph Durling were clearly our stronger players but pulled off the surprise of the day by both winning 100% of their singles matches. Thursday the 2nd of June, half term week and we were off to Ashford with with a squad of nine players to take on a similar group from Ashford. Today’s match with Ashford was a first opportunity for many of the youngest players in both clubs to get their first taste of competitive match play. With players ranging from age 6 to 13 and experience ranging from a few weeks to a couple of years it was very much a learning exercise for all involved. – this time ranked according to results from the previous round. to Twickenham Billy Knox, Nathan Maghlaoui and Kush Verma. Many thanks to Mark Roper for his report and organisational skills. Sunday May 1st 2016 and four junior players made their debut to serious competition at the Jarvis 2* competition. Kush, Oliver and Anant and Aryan played in their respective groups in the morning. Aryan in the U.12's was a little out of his depth as he met far more experienced players while Kush and Oliver were matched up against each other and in a group with the England No.2. Today was the first trial date for the Richmond upon Thames Table Tennis Team. With a number of our better players not showing any interest in the event some of the boroughs aspiring players took to the tables. Some of the young hopefuls are showing a great deal of promise but as yet need to develop their styles and grow in experience. Silas Woolway dominated his group with comfortable wins over Ethan, Billy and Nathan, while in the other group Julian Charlton Lee comfortably won his group against Anant, Jay and Joe. In the final play off 12 year old Jules (JCL) played well against a an older, stronger but slightly out of practice Silas, winning the match and the trial. Well done to both the finalists Jules on keeping his nerve and Silas on accepting the loss very graciously. The trials will continue this coming Saturday to allow any absentees from the first trial to claim a squad place. This weekend Saturday 26th March 2016 saw the Russell Grant Cup competition played at our club. The competition is a Junior Inter-league Competition between Middlesex Leagues. Wembley and Harrow, North Middlesex, Staines, and the South and West Middlesex leagues were all invited to play. Unfortunately the Staines League were unable to field a team but Wembley and Harrow and North Middlesex were both able to field two teams while the South and West Middlesex League were represented by players from our club. It was both an honour and a privilege to host the competition as our club is never utilised for Table Tennis England events, or for any other table tennis events apart from our own usage. I have to commend all the visiting players, parents and coaches on making the day a most enjoyable experience as the day progressed with a great spirit of competition but also sporting behaviour. The size and strength of the opposing leagues was really quite formidable when compared to our league of one division and only two clubs having any junior players. So it was quite commendable that our squad of Charlie and Alex Rahbani, Alex Gough, Medha Verma and Hardeep Dhaliwal managed to finish in fourth place from the five teams. and perhaps the performance of the day was to lose 5-4 to the overall winners Wembley and Harrow 1 . Twickenham Brunswick has gone through a successful era when we have produced over a dozen or more very talented players. The players that have been successful have gradually moved on and gone on to university, or given up the game. However the club does not now have the number of keen players who recognise how well they have progressed and have a desire to reach their potential. Some players reach a good standard and know that to improve further, it will need effort, at which point they gradually play less, win less and therefore get little satisfaction through playing. 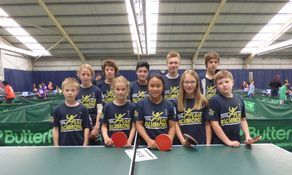 The club is constantly on the lookout for young players who want to do well at table tennis. If you have the desire and the will to succeed you will and that applies to everything. 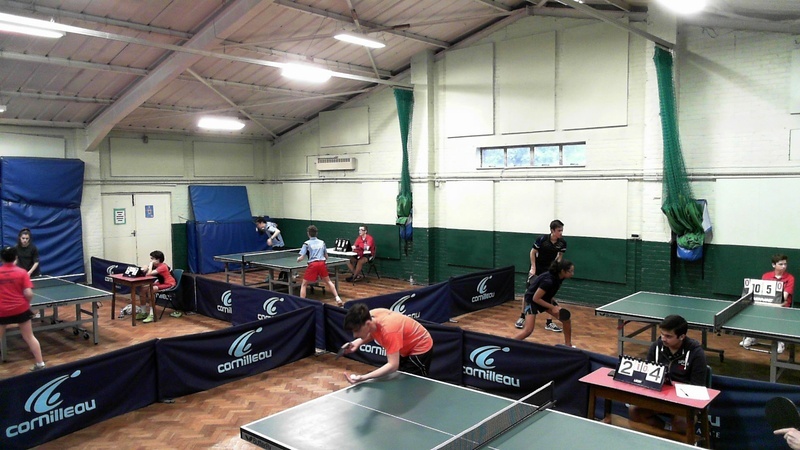 If you want to try table tennis you do not have to be good, we will help you achieve that. Medha is now the new success story to come out of Twickenham Brunswick. We may not have the financial backing of sponsors or the coaching structure of centres of excellence, but Twickenham Brunswick still are able to produce classy table tennis players. Medha started attending the club when she was quite young with her Dad and over the past 4-5 years she has worked hard at her game training within the club with her dad and gaining useful practice outside of the club at Table Tennis camps and with other players and coaches. It was a great way to start the New Year. What would have been a very quiet morning at our Saturday session turned into a competitive but friendly event against a group of young aspiring players from Ashford. The morning's event was out of necessity a little "random" as we had no idea how many would arrive. In the end we had a group of 15 players that we placed into three groups of five with a spread of abilities. After the first round we ran a second group of matches reflecting their achievements in the first groups. Fourth to sixth places were achieved by Giacomo Giarola, Amol Apte and Matt Palmer also in that order. Places 7-15 Rahul, Ismail, Ellie, Ayush, Liam, Ben, Joseph, Resandu, Nathan. On the way to victory she beat Erin Greensmith ranked in the 60's or 70's and Charlotte Weatherby ranked no.17. This result is just reward for the hard work Medha puts in, in practice. Medha is a great example to all the club members of what can be achieved with a little dedication. 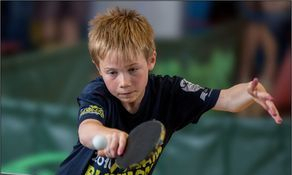 Although every day is table tennis day at Twickenham Brunswick, we tried to recognise the day as being a bit special by holding a junior and senior tournament. As is often the case when we hold internal competitions support was a little on the low side as the club members know their place within the club structure. 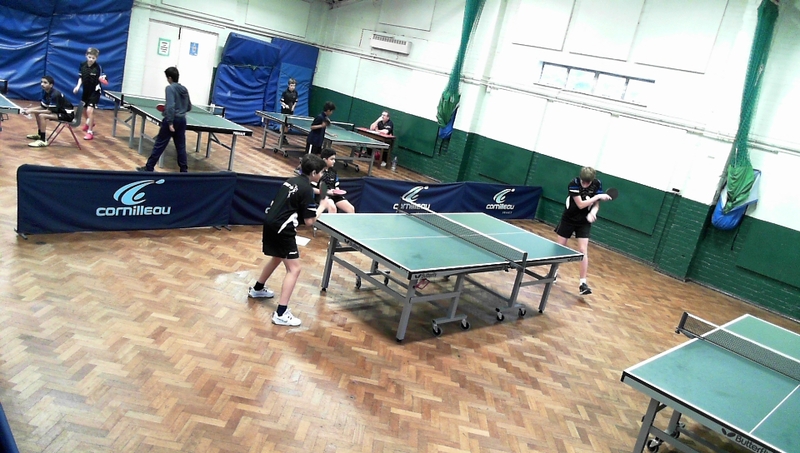 However the ten juniors who turned up played two round robin groups of five to find the top two of each group. The number ones then played off for first and second and we decreed the number twos were third place equal. Hardeep beat Alex in the final which was a very close affair. The remaining eight players enjoyed some tough competitive play which will stand them in good stead for the coming season. For most of the group this was their first ever competition so well done to you all. 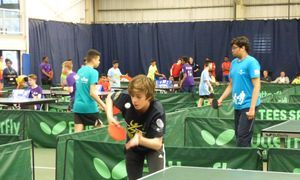 Friday evening eight juniors form our club travelled over to Ashford for a taster evening of competitive table tennis. Three of our players had already had a little experience of lower level competition in the National Cadet League and National Junior League for the other five it was their first introduction to competitive league play. Our players ranged in age from 10 -17 with the majority being 13 or under.Silas and Liam the older two players did well using their age and experience to help them win most of their matches. The younger players hardly won a game between them although the points in matches were pretty close. 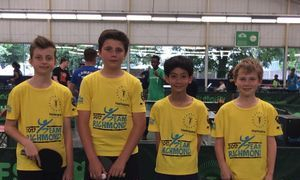 In spite of efforts to encourage more participants to trial for the Richmond Borough team, the LYG Table Tennis event took place this weekend at Redbridge with just three boys representing the borough and unfortunately no girls team at all. Finlay Feil and Hardeep Dhaliwal, now experienced players, led the team supported by the up and coming Morgan Wilkins. The team were in a group containing Waltham Forest, Camden and Croyden. who were the seeded team. It is always difficult to assess the strength needed to win a match, but we started the day playing Morgan and Hardeep as the two singles players against Waltham Forest. Morgan and Hardeep beat both of their players and Finlay joined Hrdeep to win the doubles earning us a 5-0 victory. Against Croyden things were different. Finlay joined Hardeep in the singles and after the singles matches the match stood at 2-2, Reiss Vydelingum having won his two singles and showing why he is ranked 19 in the cadets. The doubles went the way of Croyden and we succumbed to a 2-3 defeat. Our last match against Camden again Morgan played in the singles with Finlay wher both won their respective singles giving us a 4-0 lead and when Hardeep and Fnlay paired for the doubles again the match was won 5-0. Well done to the team and Alex Gough for helping with the management. Well done to all those from our club, who competed at the recent London Qualifiers for the National Championships Finlay and Ishaq found the competition tough finishing just outside the top two places in their groups, while Jules found the competition very hard in in the U.12's however none can be faulted on their effort. Well done to Medha and Morgan for continuing the the clubs history of success in having members playing in the National Championships for the last five years. Previous representatives have been D.Rahbani, A Egan, C. Rahbani, J.Corner, R.Folan, A.Rahbani, F. Feil, H. Dhaliwal, A. Rahbani, M. Verma, and M. Wilkins. The qualifiers for the National Championships for cadets and juniors took place at Morpeth School earlier this month October 2014. Although few of our players entered those that did were great ambassadors for the club, winning, losing and generally competing in a good sporting spirit. Although none of our players qualified outright there is a possibility that Rhiannon Folan might be called up as a reserve to represent London. Both Morgan Wilkins and Medha Verma performed well in the cadets against the very best players but found defeating the slightly lesser opponents a struggle. Rhiannon, Medha and Alex also competed in the Junior Qualifiers where a similar pattern emerged. Twickenham Brunswick will be represented by Morgan Wilkins at the National Championships for 11-14 year olds. Ten year old Morgan started as an absolute beginner 2 years ago when I suggested he could be top 20 in England in his age group within the year. Unfortunately we never found out as the divulging of ranking information other than the main rankings was scrapped. Morgan practiced once or twice a week during the first year but then stopped for the summer only to return as a member of the boxing club. After a short while he returned to table tennis training, and playing in the National Cadet League and National Junior League. at the end of his second year after 18 months of training he entered the London Qualifiers for the Nationals and finished fourth in his group. On the weekend of the 1st of June 2014 Morgan will be travelling to Doncaster to play in the U.11 boys competition where he will be matched up against Amirul Hussain the England No.1 also No.8 at U.13. A win might be a little too much to expect, but I will be highly delighted with any score as long as he plays to his potential both regards to his style and determination. We would like to than Mark Roper for organizing this tournament during the holiday period. Well done to those of our club who were available to attend as without you the event could not have happened. Thanks to all for another enjoyable match yesterday, here are the results. Five players from Ashford/Twickenham Brunswick represented Middlesex/Surrey in the first round of this seasons junior county championship . 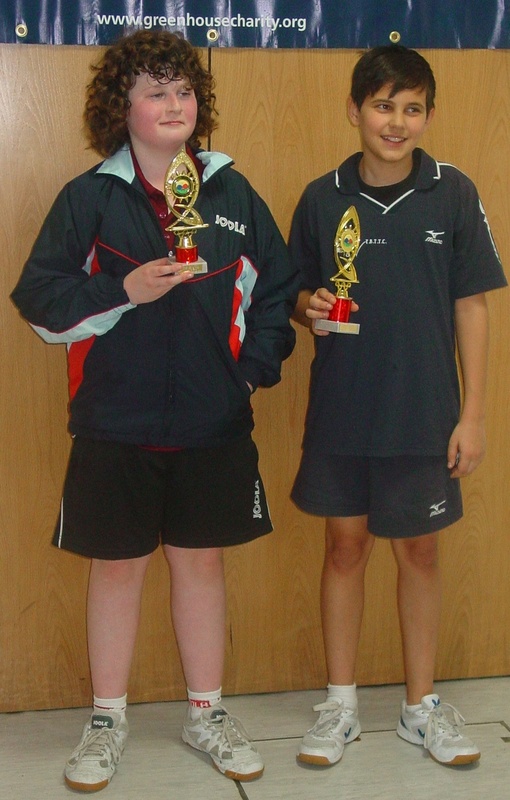 David Rahbani (Middx I) and Rhiannon Folan (Surrey I) both played in the premier Division ( the highest level in the competition). David did exceptionally well winning 3/6 of his matches. He also went to 5 sets with Alec Ward ( ETTA rank 11) of Cleveland, a great achievement considering Alec beat Adam Harrison ( ETTA rank 3) the previous day. Rhiannon also did very well against very strong opposition, most of the other girls were ranked in the top 20 in England or top rank in Wales. She managed to win games off a couple of top 10 English juniors and beat the no 2 girl from Kent. A great debut to her county table tennis career. Tony Egan (Middx II), Danielle Kelly ( Surrey II) and Medha Verma ( Surrey II) played in Div 1B hosted at Ashford . Tony played very well to win 5/6 of his matches against Surrey II, Essex I and Essex II. The girls found it very tough in their first outing at this level  5 out of 6 of their opponents are ranked in the top 35 juniors. However Medha managed a win beating Essex II No 2 player Zoe Davies. Danielle did well too taking a set off Jane Li of Essex I, a great result considering Jane is ranked 21 in juniors. Both girls are still only 11 years old with at least another 6 years playing county table tennis, their time will come. Congratulations go to Alex Gough and Alex Rahbani who will have gained some valuable experience playing in tough group matches in the junior and cadet age groups respectively. Medha Verma who finished fifth in the Cadets Girls finishing as second reserve. Bank Holiday Monday saw five players from Twickenham Brunswick travel to our neighbouring club Ashford to participate in a four club junior tournament. In total there were some forty young players representing Reading, Rosehill, Ashford and of course Twickenham Brunswick. It was disappointing that we had so few representing us, but at the same time it was great to see two new players making their first appearance in competitive play. Theo Hainsworth 10 has only been playing a year and Luca Chan 8 just a couple of months, but both played outstandingly well considering their lack of experience. Theo in Band C won five matches and narrowly lost just three, while Luca managed two wins. Hardeep Dhaliwal played In Band B so that we were represented in all four bands, but proved to be far too strong for the group winning all his matches. In Band B Hardeep finished on 100% and made us the clear winner. On Saturday 6th July there will be a club tournament for junior members. It was a shame that more players did not take the opportunity to take part in the club tournament, but for those who came there was a full morning of competition for the U.13's. There was also no lack of talent as all the six players at U.13 were ranked inside the top 200 in the ETTA Rankings. The format for the tournament was a round robin with the top three players performing up to expectation. James Corner (25) finished top, having completed his matches unbeaten, Michal Papior (58) overcame all his opponents apart from James which included a narrow victory in five over Finlay Feil (62). Positions 4, 5 and 6 though did not follow to form. Matthew Hazell (195) who has been training hard recently, finished fourth beating Alex Rahbani (70) and Tyrell Soleyn (132) with Alex finishing fifth and Tyrell sixth. The arrival of Jack Richards, Alexander Gough and John Barman meant that the U.15's tournament went ahead with eight players. The format was two groups of four which saw James, Michal, Finlay and Jack qualify for the final stage, but after the initial groups the weather and other commitments saw a couple of players make an early exit. The final groups were therefore a play off between the U.13 top three and Alex Gough, Matthew Hazell and John Barman for third, fourth and fifth place. The outcome was the same as previously with James beating both Michal and Finlay, and Michal again defeating Finlay in a close 5 set match. Congratulations to all James Corner on winning the U.15's tournament and to all the players on turning up and making the competition worthwhile. The season is drawing to a close for table tennis, but there has been no easing up by the players at Twickenham Brunswick. In the latest ETTA ranking list no less than EIGHT different players appear in the top 100 of the England rankings for their age group. The U.13 list makes interesting reading with SIX Twickenham Brunswick players appearing in the top 140. All this at the end of a week that saw our cadet Division 1 and 2 teams overcome quite stiff opposition in the NCL cup competitions at Capital City Academy becoming champions in both divisions. This weekend saw a number of our players making the long journey over to Morpeth School for the London Region Qualifiers. On the Saturday we were short of a couple of top 100 U.13 ranked players with James and Michal away for Easter but the two players available did extremely well in representing the club. Tyrell Soleyn came third in his group so missed out on playing for a qualifying place. he did then go on to win all the games in his final group, giving him a good win lose ratio. However Finlay Feil, surpassed all expectations, and in keenly contested groups that showed there was little to choose between the top 8 or so players, he performed brilliantly to qualify in second place for the national U.13's Finals beating E Gozcu ranked 49 at U.13. Medha Verma competed in the girls u.13's and just missed out on a qualifying place but finished as first reserve. On the Sunday we again travelled for the u.12 and U.14 competitions. In the u.14's John Barman and a Alex Rahbani, who was far from well, struggled in their groups but went on to have many good wins in later rounds. Medha again had a very good day and surprised us all by finishing in first place to qualify for the national finals. Meanwhile Finlay Feil playing in the u.12's won his first group but then suffered a defeat at the hands of Kai Gazzi Timms which put him out of the running for a qualifying place. 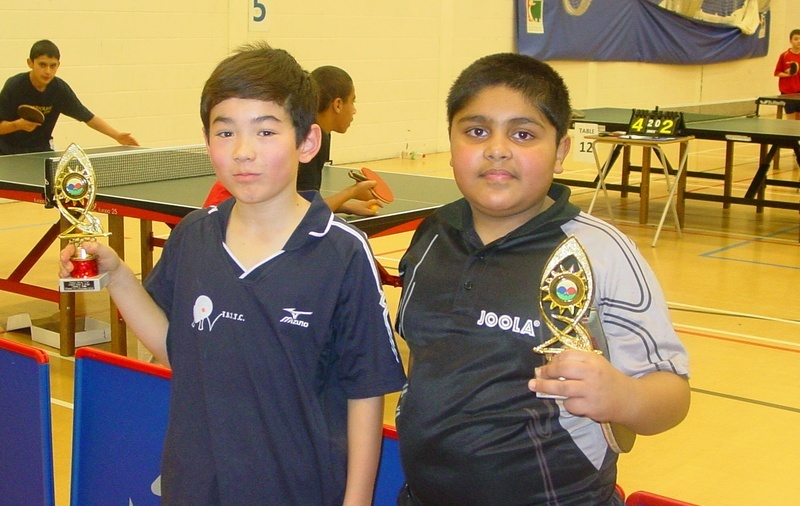 However in the play offs for 5th-8th place after he suffered a further defeat by Z Premji he performed outstandingly well redeeming himself with two good wins over J Dignum and T Achampong (ranked 43 at U.13) who had both beaten him in the U.13's competition the day before. On countback this placed him top of the group and 1st reserve for the national finals in the U.12 age group. Well done to everybody who took part we will be well represented at the nationals once again this year. The 2 star Dulwich tournaments was a huge success for David Rahbani as he reached the final to then face James Denyer. He played outstandingly well but was not able to win it. He took second place with his first financial win of £30 and a medal. Anthony Egan also played very well to finish in fourth place losing to Musa who had to play David in the semi-finals. This was a huge achievement for both players. Charlie Rahbani did well to get through the group stages but lost in the knock out stages. On the other hand Alex Rahbani did brilliantly getting through his group stage and then having a great win against Michael Tunubu. Then in the semi-finals he faced James Smith and did fantastically to get a set of him. Overall it was a fantastic day. streak with two more convincing successes. while Tyrell and Medha fought well but to no avail. triumph both had some good wins against higher ranked players. in a close final contest, ending the day victorious and undefeated. 100 players at U.13 than Twickenham Brunswick. 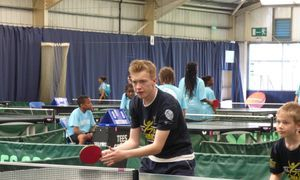 Richmond Boroughs in the Balfour Beatty London Youth Games. as there were only two boys over the age of thirteen out of the squad of 6.
all did their part in picking up games against all but the highest ranked players. Hounslow repeated their success of last year by making it through to the finals at Crystal Palace. Congratulations to David Rahbani on winning the U.18's Junior Tournament last weekend. It is the best result the club has achieved and was sweetened further by the fact that in the Final he over came Anthony Egan another player from our Club. Anthony ranked (231) had reched the final by beating much higher ranked players such as Andre Dunkley (98) and Charlie Austen (89) and is equally deserving of recognition. Well done too to Rhiannon Folan who reached the semi-final of the girls u.15 age group.In her group she lost to Katie Cheer, and in the semi-final she was defeated by Evie Forster, But both the higher ranked girls were aware they were in a battle although Rhiannon lost 3-0 and 3-0 the games were close as Rhiannon made them work for every point. Last wednesday we took nine players over to Ashford for an afternoon team competition. The players were split into three fairly equal teams to play each of the opposing teams. inexperienced players ranging in age from 9-11 but that did not stop them giving their all. This weekend 22/23 October 2011 sees a new milestone for the club.The club will be sending some of its players to play in the first round of Junior British League. Unfortunately as often happens our strongest team is not available for the full weekend so David Rahbani, Charlie Rahbani and Tom Bell will be playing on the Saturday and Jack Tubby and Anthony Egan will be travelling up to join Tom Bell on the Sunday. James Corner, Alex Rahbani and Rhiannon Folan have been promoted to the first division, while John Barman, Hardeep Dhaliwal and Jack Richards take their places in the second team. The third team sees Sam Reynolds appearing in his second season, while Alexander Gough and Alexander Anglin two newer players make their debut for the club. It has been a bit of an effort to fill the three teams this week, with some players giving up during the summer break, and another half dozen either being on holiday or otherwise engaged. A big thank you to all those turning out to represent the club, most importantly, enjoy yourselves, play in the spirit of the game and be great ambassadors for the club. 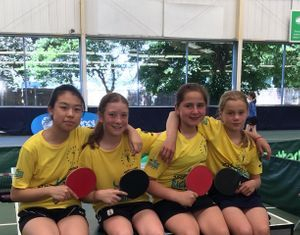 Twickenham Brunswick took a strong squad of young table tennis players to the Ernest Bevin 2* Tournament this weekend and demonstrated for all to see why they have every right to be proud of the young players they have developed. With three players ranked in the top 20 in England it was no surprise that two made it through their groups to the last eight in the knockout stage. Alex Rahbani lost to Tyreek Edwards in the last eight of the knockout, but team mate James Corner, No.6 in England came through his group to beat T.J. Stewart No. 10 in England thenTyreek Edwards No.17 in England.. In the final he met Bejay Arjan the England No.18 whom he beat with a steady controlled performance that earned him the U.11 title. Not to be outdone Charlie Rahbani, ranked 14 in England in the U.13 age group, competing in a large entry of forty eight players coasted through his group making his way through to the semi final where he met Omar Khassal ranked 17 in England. In a hard fought game Charlie came through winning 3-2 in games only to meet the England Number 11 Oliver Gunns. In another closely contested match Charlie Rahbani showed that he was that little bit more tactically aware and crept through to win the U.13 age group final with another 3-2 victory. Well done to all the squad, David rahbani who lost in the last eight of the U.15's, Jack Tubby and Anthony Egan who won some games against very strong opposition, and John Barman, Finlay Feil Joseph Farren and Hardeep Dhaliwal who continue to show why they are ranked amongst some of Englands top younger players. U13s: Charlie Rahbani (Mi) beat Ollie Gunns (K) 11-6, 5-11, 11-5, 12-10. U15s: Danny Lawrence (K) beat Lobsang Lama (Sy) 11-2, 11-5, 6-11, 7-11, 11-8. U18s: Bradley Tuttle (He) beat Danny Lawrence (K) 5-11, 11-4, 11-7, 11-7. Girls: Round Robin: 1st Eda Aydin (Mi), 2nd: Denise Payet (Mi), 3rd: Tiana Dennison.